CapTel will contact you directly to set-up installation of phone. Due to high demand there is a 3-4 week wait period. 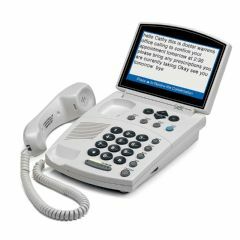 AllegroMedical.com presents The CapTel 840i Captioned Phone. The CapTel 840i Captioned Phone is a traditional-style phone that shows word-for-word captions of your conversation on a large, 7" easy-to-read display. The CapTel 840i is an ideal amplified captioned phone solution for people with low vision or who have difficulty reading standard-sized captions. It connects to both your telephone and Internet service to give you the best of both worlds: voice and captions. The captions are provided by a free service that uses the Internet connection to automatically display captions for every call, quickly and accurately. Captions are available on calls within the United States only. Five year manufacturer warranty with 90 day money back satisfaction guarantee! Watch an overview about CapTel. Video testimonial from a CapTel user.